While it's easy to get caught up in this noise, investors trying to get ahead of the curve need to focus on the big trends. We have identified these big trends in The Global 20. The list includes the rapidly growing field of genomics, a group of emerging countries that are outpacing the BRICs, and the revolutionary new way that retailers sell goods. Commodities garnered substantial attention this year after natural gas and coal prices collapsed amid an unusually warm winter. 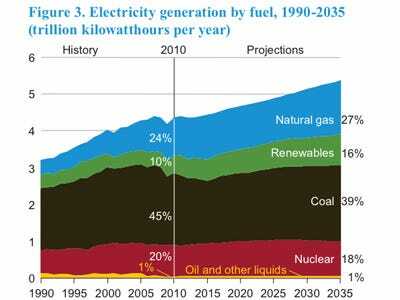 But forecasts for future energy generation in the U.S. remain surprisingly robust. 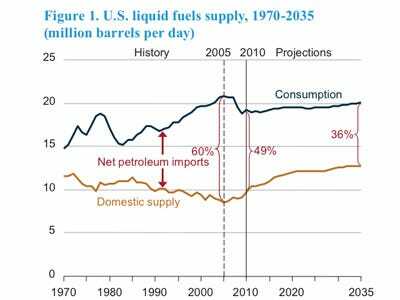 The U.S. Energy Information Administration projects that the country could halve its reliance on total energy imports under the best scenarios, and under higher consumption scenarios could lower imports from 24 percent today to 17 percent in 2035. 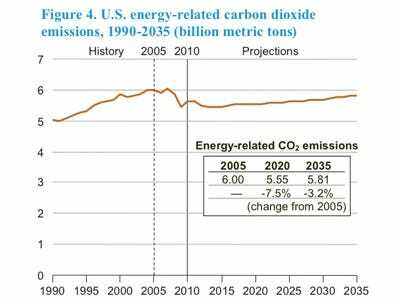 The EIA estimates that most of the gains will come from increases in natural gas and renewable energy production as a portion of total energy generation. In fact, the EIA sees the U.S. becoming a net liquefied natural gas exporter in 2016 and an overall net exporter of natural gas in 2012. Liquid reliance, which depends heavily on auto use and miles driven, is also seen declining as consumption needs by U.S. consumers remain below pre-2008 crisis levels. On the green front, state rules impacting electricity generation and federal laws on ethanol blending will have the greatest impact on the country's shift to renewable resources. However, the recent investment by the federal government in a number of green technologies has fallen under scrutiny; the failure at Solyndra and continued difficulty at First Solar have put the survivability of the U.S. solar industry into question. First Solar is now betting its future on the move by American and foreign utilities to large scale solar generation prompted by state regulations. By 2016 First Solar is targeting some 3 gigawatts in sales through these solar fields. 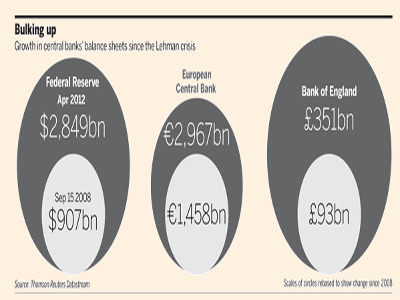 Central banks have flooded markets with liquidity through QE 1, QE 2, QE 3, and LTRO. What's going to happen when they stop? 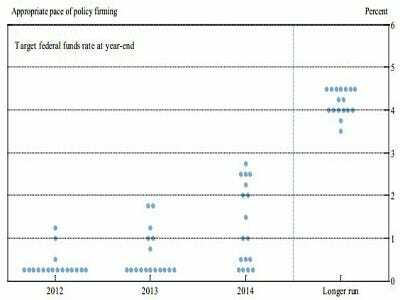 Given the current state of the recovery in the States, another round of quantitative easing is uncertain, but if we believe the Fed's forward guidance, we can't expect tightening until 2014. Europe's recovery may take even longer, and if Greece exits, further recapitalization of banks may be required. The rampant inflation that some expected after large balance sheet expansion hasn't occurred, a consequence of a lower money multiplier and the "liquidity trap." But how central banks exit will be very important. One consequence of continued low interest rates and easing is an inability to respond to further shocks. The second round of quantitative easing was less effective than the first, and less effective in general due to intense demand for liquidity and treasury bonds. It is unlikely there will be much room for rates to move downward for years to come. This, coupled with debt concerns and government unwillingness to act, suggests that both monetary and fiscal response to future crises will be constrained. The other consequence is inflation. Expectations for inflation are still very low, but any rise would constrain central banks, especially those like the Bank of England with a single mandate to maintain price stability. These policies, coupled with increased regulation, have had a profound effect on the financial system. Central Banks have traditionally expanded the monetary supply by making open market purchases of government bonds. Intense demand for liquidity and safe assets has pushed rates to historic lows, but they are increasingly scarce, and it is more difficult for banks to comply with new risk requirements. 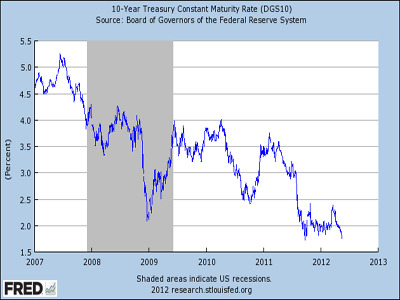 This chart of the rate on 10-year treasury bonds reveals how intense the demand for "safe assets" is. Those requirements may constrain growth in the future if banks must divert so many resources to safe assets. If central banks start to end their provision of liquidity, it is unclear how banks will effectively respond to shocks. That was U.S. Army General William C. Westmoreland in 1969, and his words turned out to be quite prophetic. Unfortunately, in 2012, the world is still embroiled in several major armed conflicts. Nations like the U.S. are increasingly turning to drones to carry out surveillance and strike operations in the Middle East—the U.S. military now possesses more than 7,000 units, and you can count on other militaries following suit to adapt to the ever-changing theatre of war. How large is the U.S. military’s commitment to this new form of combat? Digging down into the defense budget produces telling results. The chart below originally appeared in the Department of Defense’s long-term Aircraft Procurement Plan that was submitted with the FY2012 budget. 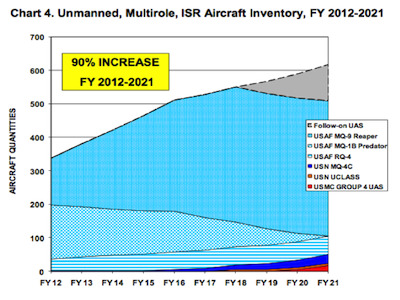 It shows a 90 percent increase in investments in unmanned aircraft over the next decade. The MQ-9 Reaper, with a sticker price of $30.3 million per aircraft, represents a sizable portion of the increase. 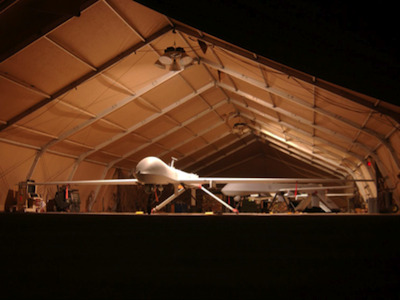 The Reaper is manufactured by General Atomics, a private defense contractor in California. The RQ-4 Global Hawk, manufactured by the publicly traded defense contractor Northrop Grumman, will be a significant addition to the U.S. arsenal as well. This sort of investment should leave no question with regard to where the future of defense spending is headed, and the companies that can adapt and innovate in the unmanned, electronic warfare space will be poised to win big when other countries upgrade their forces in size as well. 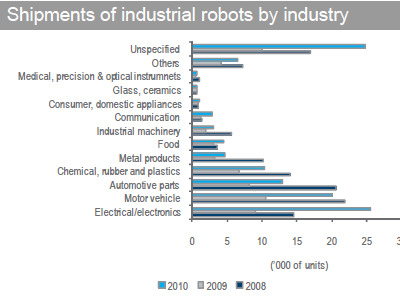 Robotics and automation will be in greater demand over the next several decades. As populations age, standards of living and wages rise, and technology improves, demand will dramatically increase. The benefits are obvious; robots can work 24 hours a day, seven days a week, are incredibly consistent, and can take over dangerous work. The sort of robots that already exist are industrial robots. The potential growth in this sector is enormous. 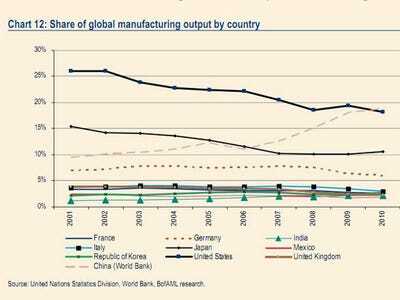 They allow manufacturers to have high productivity factories with much lower wage and other overhead. This could potentially mean the end of trends that have seen companies move overseas for cheap labor. Sales were 118,337 in 2010, and around 1 million total units were in operation. Those numbers are expected to rise to 166,700 and 1.3 million in 2014. So far the automobile and electronics industries have been the principle buyers, accounting for 60 percent of demand. 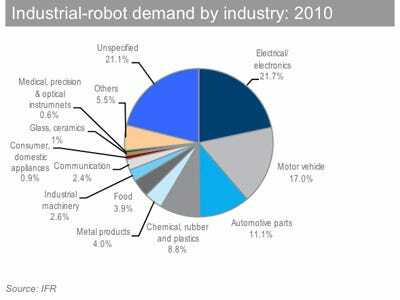 There is significant room for growth in the chemical, machinery, and food and beverage sectors. Looking to the future, service robots will become increasingly common. Consumer, cleaning, and surgical robots already exist. These range from relatively simple consumer robots like the Roomba to increasingly sophisticated tools for heart surgeons. Scientists have also begun to develop robots that can improve the lives of those who are paralyzed or have lost limbs. Demand is expected to double to 4 million by 2014. 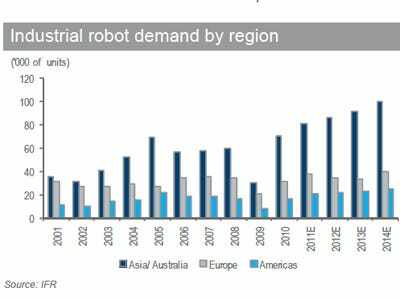 The abilities and market availability of most of these robots is quite limited, but as they improve they will become more common. Military robots—primarily drones—already see significant use by the United States. As countries look to reduce military cost, the use of robotics is an appealing option. It is currently rare to encounter robots in day-to-day life, that will change over the next 20 years. The industry represents a possibility of a cheaper, more energy efficient, and safer work force. There's a balance to be struck by those attempting to enter or profit from the industry. There are still high entry and technology barriers, and those who adopt inferior technology too early will end up having to replace it. When it is not just industry giants that produce and use this technology, but small firms and consumers, the global economy will transform. For years as China rose and U.S. manufacturing declined, people said those jobs were gone for good. The U.S. had a competitive disadvantage; developing nations had lower wages and looser regulation. It has surprised many that one of the most positive forces during the recovery has been a resurgence in U.S. manufacturing—growing payrolls, increased exports, and improving productivity. 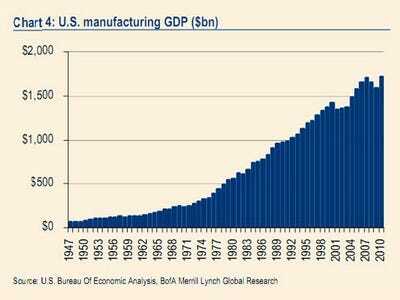 U.S. manufacturers have added some 489,000 jobs since 2010. Gains are coming from improved competitiveness, which could bring as many as two to three million jobs back to the United States, touted by President Obama as "reshoring." U.S. manufacturing unit labor costs declined 10.8 percent between 2002 and 2010, an decrease matched only by Taiwan. Auto manufacturing has been an area of strength, accounting for 1.12 percent of GDP growth last quarter, about half of total growth. 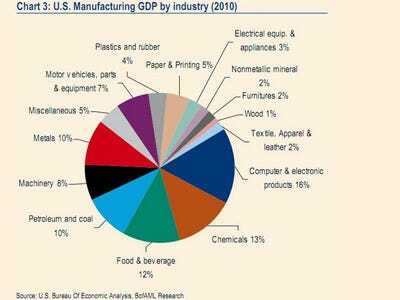 Other strong areas in U.S. manufacturing are computer and electronic products, food and beverages, and chemicals. Increased productivity, historically low natural gas prices, and natural advantages in chemical and IT manufacturing help as well. A weaker U.S. dollar and rising wages in the developing world are central. China is the perfect example for both; the renminbi has appreciated 30 percent against the dollar since 2005 and wages are increasing 15 to 20 percent each year. All of this, and easy access to the world's largest market, make the U.S. substantively more appealing for manufacturers. Emerging market demand is boosting U.S. exports as well, up 17 percent last year—61 percent of those exports are manufactured goods. If costs in the U.S. remain at present levels, emerging market relationships are maintained, and the U.S. continues to produce the sort of workers needed, this sector will be one to drive the economy forward. Water. It's the most basic need for every form of life on our planet. It permeates every aspect of daily life. We drink it when we are thirsty. We use it to cook and clean. It's used to generate energy to power industrial processes and to grow foods that feed the human race. The world's population is growing rapidly. Indeed, this theme is integral to many of the G20 investment ideas that will shape the next decade. 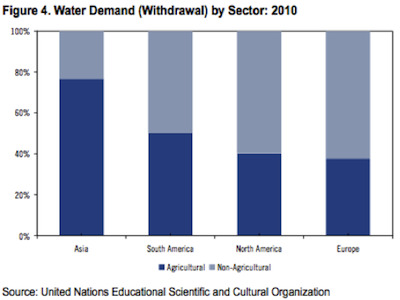 In developed nations, most water demand is derived from non-agricultural sectors. As the global population swells and developing economies urbanize, they too will spur massive water demand for municipal and industrial uses. While much of the earth is covered in water, only 2.5 percent of this is usable fresh water (as opposed to saltwater, which comprises the world's oceans), and only 0.26 percent of that 2.5 percent is easily accessible above ground. 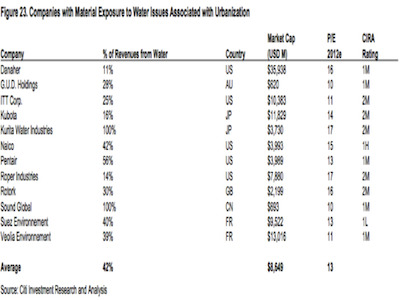 These supply and demand factors present a clear challenge to the global water market. What are the technologies on the forefront of this water revolution? Think desalination—converting our abundant salt-water resources into usable fresh water. Think filtration—converting that fresh water into a liquid safe for drinking and other home use. Companies will also need to meet demand for industrial treatment, automation and irrigation, and valves, pumps, meters, and pipes, among other things. The industry is large and will only grow larger. Imagine roads unencumbered by the dangers of intoxicated, sleepy, or distracted drivers. Imagine being truly free to spend your time in the car as you please—perhaps watching a program or reading a book on your way to work. Or what if you never had to worry about parking again? What if your car dropped you off, went and parked itself at the nearest space, then drove back to pick you up? 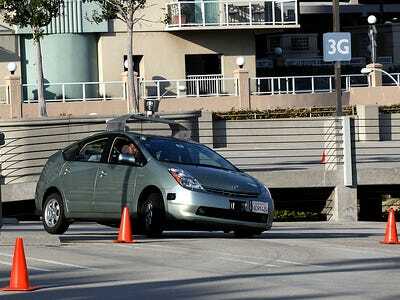 Believe it or not, the driverless car is not only very real but is also making some serious progress at the moment. The Google driverless car, a project spearheaded by a team of engineers and researchers at Stanford, was just approved in Nevada earlier this month for the first ever drivers license for an autonomous vehicle. Legislation is currently in the works in California and other states to regulate these new technologies as well. Large auto manufacturers like GM, BMW, and Audi are also working on semi and fully autonomous vehicles as well. Alan Taub, the R&D head at GM who retired last month, expects that driverless cars will be available for purchase en masse by the end of this decade. What will the market for automated vehicles be like? A recent J.D. Power and Associates survey asked respondents whether this is something they would want to buy. The results; 37 percent said they were interested. Those are the first adopters: one can imagine how this number might rise in the next 10 years, especially when the neighbors pull up in a nice, new, driverless car. 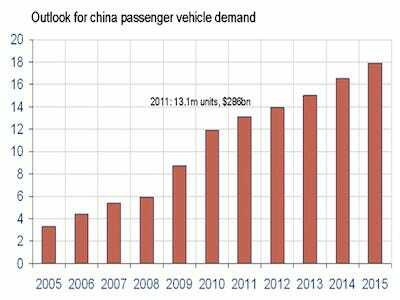 And given the size of the market for vehicles in the U.S. as well as in developing nations like China, automated vehicles seem like a pretty good bet.